Is there a place for Pandora in a post-Spotify world? Apparently so, because 76.2 million people last month listed to 1.58 billion hours of music on the service. 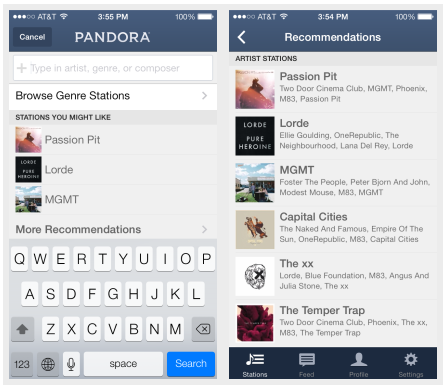 Still, Pandora isn’t resting on its laurels: the company announced that it’s launching personalized station recommendations on both Android and iOS. The recommendations – up to 6 artist stations to add or listen to at a time– are determined based on current listening preference, song likes and dislikes, and your station list. As has always been the case with Pandora, the more you engage with the product, the more it will learn your musical preferences and be able to further optimize the station recommendations. They can be found both at the “create a station” screen and at the bottom of your station list. Also, your station recommendation list is refreshed when a new station is created or deleted. The feature has already begun rolling out, so you should see it on your smartphone and/or tablet shortly.